On Sale Now! Free Shipping Included! Save 5% on the VIVOSUN 8 Inch Noise Reducer Silencer for Inline Duct Fan by VIVOSUN at Sun Light Village. Hurry! Limited time offer. Offer valid only while supplies last. CUTS NOISE DRAMATICALLY:Reduces irritating and damaging noise levels for auditory health and more pleasant living and working spaces. Decreases fan noise by up to 50%. SPECIALLY DESIGNED SOUND INSULATION: Made with thick, commercial grade neoprene foam for maximum noise reduction. Specially selected open cell texture is combined with egg crate molded foam for superior sound absorption. UNHINDERED AIR FLOW: Thick foam insulation stops sound waves but allows clear air flow through the system; Keeps your system running smoothly and efficiently without strain. EASY INSTALLATION: Easy to install and maintenance free, flanged on each end for convenient hook-up, arrives fully assembled. VERSATILE APPLICATIONS: Connects with 8 inch fans, ducting or accessories. 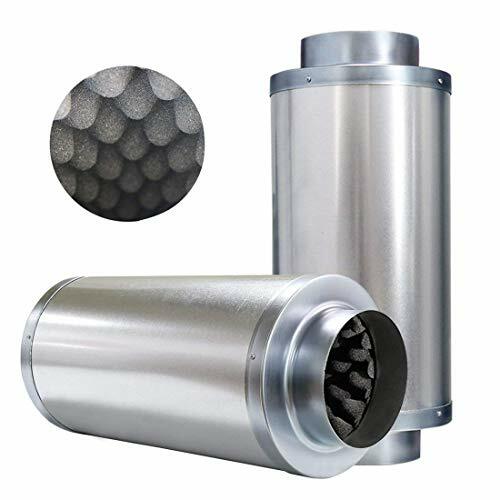 Intended for use with high velocity fans/blowers, perfect for reducing noise from fans and carbon filter systems, can be hung or supported in a variety of ways to suit the desired set up. If you have any questions about this product by VIVOSUN, contact us by completing and submitting the form below. If you are looking for a specif part number, please include it with your message.